Reinhardt University students fared well March 18-19 at Stetson University in DeLand, Florida, at the Southeastern Regional National Association of Teachers of Singing Student Auditions. Reinhardt vocalists competed with more than 350 students from Georgia, Florida and Alabama. Mikensley Clayton, Nik Griffo, Dr. Cory Schantz, Chase Brackett, Clark Cumbee, Tyler Smith, Mary Allia Endredi, Alan Stein and Dr. Rebecca Salter. 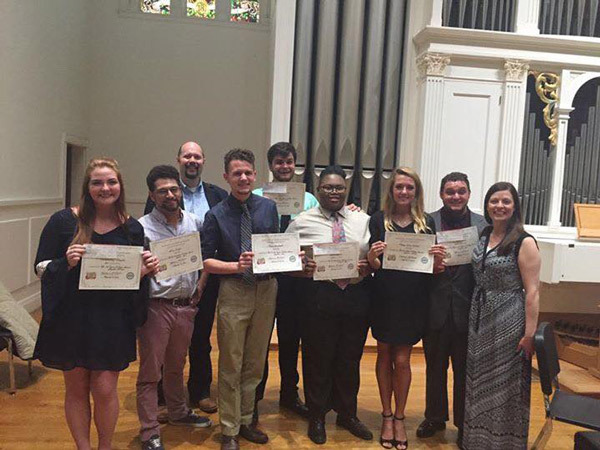 “We are proud of all of our students who participated and represented Reinhardt in the SERNATS 2016 Student Auditions,” said Dr. Rebecca Salter, assistant professor of music – applied voice. In the Freshmen Music Theater Women category, Mikensly Clayton earned first place. In the same category for men, Alan Stein earned second place. Tyler Smith took second place in the Sophomore Music Theater Men, while Clark Cumbee earned second place in the Junior Music Theater Men category. Mary Allia Endredi placed as a finalist in the Freshmen Music Theater Women category, Chase Brackett was a finalist in the Freshmen Music Theater Men category, and Nik Griffo earned a spot as a finalist in the Sophomore Music Theater Men category. Semi-finalists include Katherine Manettas for Junior Classical Women, Courtney Boggs for Junior Classical Women, Mary Echols for Junior Music Theater Women and Sarah Williams for Sophomore Music Theater Women. The seven winners and finalists now have the opportunity to compete in the national round of student auditions. In addition to the students competing, Dr. Salter serves on the Regional Cabinet at the SERNATS Registrar and coordinates the SERNATS student auditions. The rest of the Reinhardt voice faculty, including Dr. Anne Beloncik, Dr. Reverie Berger and Dr. Cory Schantz, served as adjudicators during the event.